Somewhere in Swedish Lapland, nestled among mountains and glaciers, lies the mysterious Tarfala Valley. The dramatic, dreamlike landscape, will forever be etched in my mind. In the beginning, I didn’t believe such a place would actually exist. Then, I didn’t believe it possible for a mere mortal as me to set foot on such a magical place. Finally, I turned this vague and hazy dream into reality. After a harrowing experience at Kebnekaise, I was looking forward to fewer surprises as I headed towards Tarfala. Just a week before my trip, I couldn’t confirm if it would be feasible for me to find the enigmatic valley. I received the assurance I needed along the way, from staff at Kebnekaise and other hikers, some who have heard of it, but few who have experienced it. It was to be an easy day, just 8km separating Kebnekaise Fjällstation (Mountain Station) and Tarfala Fjällstuga (Mountain Cabin). I took my time with breakfast and packing up, before setting off for the mystical glacial valley. The first 2km went pretty well, backtracking along the trail I did 2 days ago. At the 2km point, I crossed a bridge over the only outflow of the glacier lake at Tarfala Valley. From there, the trail followed the river upstream all the way to the source of the pure glacial waters. Fresh glacial waters from Tarfala. Just casually passing waterfalls in the Arctic Circle. While just being round the corner from Nikkaluokta and Kebnekaise, the landscape feels different. Kinda reminded me of Iceland in some way. Looking back out towards the valley I came from. By then, there were no more trees, only low shrubs and bushes. The trail got steeper towards Tarfala, and soon it got really strenuous. There were 2 other guys on the trail around the same time as me. They were much older and going much faster. Can’t imagine myself at their level of fitness in 30 years. The scenery was amazing but I wasn’t in the right physical state to enjoy it. Every few minutes, I had to take a break to catch my breath. Not that it really mattered, I had the whole day to finish that last few kilometers. After a couple of steep ascents (nowhere near the terrifying near vertical ascents at Kebnekaise the previous day). The first of the snow capped/ covered peaks surrounding Tarfala Valley coming into view. Huge rock with some plague on it. Not sure what it said but thought it looked important. Passing the first glacier (Storglaciären) as I finally entered Tarfala Valley. About another 2 or 3 km more to go. With one final steep ascent the majestic valley came into view. I could see all the way to the end of the valley, but still too far to be able to spot the cabins. It was breathtaking stepping through the valley, slightly over 1000m in altitude, surrounded by snow covered peaks and passing glacier after glacier. Suddenly all the fatigue from the climb seemed insignificant as I immersed myself in what must be one of the finest works of art by nature. Tarfala Research Station, which studies the glaciers and climate change. The terrain was getting difficult. With the dirt tracks ending I was finding it occasionally hard to get a footing on the huge jagged rocks covering the rest of the way. Despite covering a relatively short distance, I got tired as I neared Tarfalastugan. Then, it started snowing and I started getting flashbacks of the snowstorm the previous day near the Kebnekaise summit. My heart pounded faster and suddenly all the awe was gone, slowly being replaced by fear and panic. Fortunately, the cabin was less than a kilometer away, and I heaved myself into the cabin. I slumped onto the bench as the door shut behind me and my eyes slowly adjusted to the dim interiors of the cabin (there is no electricity in the mountain cabins). I caught my breath, and it slowly sank in that I had achieved one of my objectives in making this trip to Sweden – finding Tarfala Valley. View from the kitchen of Tarfala Mountain Cabin (Tarfalastugan). Most people go to Tarfala on a day trip, stopping by for lunch (STF cabin facilities can be used by members free of charge) before making the trip back to Kebnekaise. As not many pass by and even fewer stay the night, it was much more peaceful than at Kebnekaise. It should probably not take much more than 4 hours to arrive from Kebnekaise, as that was what it took me with my sub par fitness and heavy backpack. The last few kilometers were what took the chunk of the 4 hours. Inside the rooms. While having much less amenities than Kebnekaise Mountain Station, the beds and rooms were definitely less cramped and much more comfortable here. Wood-fired fireplaces in the rooms provided warmth, and it was especially needed in a place like Tarfala. Being from Singapore and not having started a wood fire before (previous cold places I had been to used electric heaters), I watched and learned from a very warm and helpful Finnish man. Wood was provided in the rooms but the pieces were a little big, so we went to the hut where firewood was to break them into smaller pieces. Or rather I just carried the wood and watched him slice them up like cheese. Glad to have met him on my first day out in a mountain cabin, on a crash course to learn all that I needed to survive the week. Deadly weapon or handy tool? This complicated looking piece of furniture was the fireplace. Probably designed to reduce the chances of the entire cabin burning down. My newfound Finnish friend got the fireplace up and burning in no time. Later in the afternoon, the snow finally stopped and the weather cleared a little. I went out for some shots. It was cold though, being over 1,100 above sea level and north of the Arctic Circle, so I tried to make it quick. The comfortable cabin, with a couple of dorm rooms, a spacious kitchen and a drying room (standard in almost every cabin, and as I found out one of the most vital facilities in the cabins), against the backdrop of snowy mountains and a barren rocky valley. On the left, the Cabin Manager’s cabin, and dry toilets on the right. Somehow, even without flush, they hardly smell. A spin around down by the glacier lake (Tarfalajaure). Like a lake where I can actually see the glacier flowing in, unlike the one at Yubeng, where the ‘glacier lake’ in summer looked more like a pretty puddle. The clouds cleared just enough for me to catch a glimpse of the stunning glacier flowing into the lake. Far from the largest glacier but still a mighty sight to behold. Low clouds over the valley. On the following day, I planned to cross the mountains by getting around the glacier to get to Salka. From there, I would start my hike on the Kungsleden to Abisko. It would save me a day of time, 18km as compared to 34km via Kebnekaise, where I had came from. This was however, against the advice of well meaning folks I met along the way. Accumulated snowfall and bad weather at the top of the pass around the glacier had made it unsafe. Nonetheless, I thought it would be nice to get up there for a look, even if I would not be able to cross beyond that. I mentally prepared myself to make adjustments along the way and to call off the attempt if the situation arises. Having the assurance that it would be safe on the trail to the top of the glacier (but not beyond it), I packed my stuff, strapped up the gear and headed out. My Finnish roommate wanted to make a short trip up the side of the glacier before turning back. He was leaving the mountains that day, having already spent a week here. We agreed to meet somewhere later along the trail. Another of the glaciers (Isfallsglaciären) at Tarfala. The trail would take me around the right side of the lake, crossing 2 ice sheets to get to the glacier in the middle of the photo below. From there, the trail continued up a narrow rocky ridge to the right side of the glacier, the top of which was totally covered by clouds at that moment. Going around the lake. Weather didn’t look good, but wasn’t exactly bad at that point either. Crossing the first ice sheet, the second one hidden behind the rocks after the ice sheet. By the time I was near the first, my friend was already way beyond me. He waited for me at the end of it though, just to make sure I could cross it safely. It was slippery, and sliding down wouldn’t be nice as they ended with a few meters drop onto the icy waters/ rocky ground. We originally thought we needed to go around the ice sheets, but footprints on the ice indicated a possible path that had been recently used. Crossing an ice sheet at Tarfala. Not long after, I arrived at the second ice sheet. I was starting to feel apprehensive, as I grew aware of the dangers after getting acquainted with the unfamiliar environment. My friend was in front, but out of sight, as there is a steep descent from the rocks on either side of the ice sheet of a few meters. The short descent/ ascent required almost getting down on all fours to pass. The second ice sheet, and the glacier getting closer. As I mentioned on the way to Kebnekaise, while being deep within nature in person, it is easy to feel so small and insignificant. But to see someone else out there as that small and tiny being against the giant that is nature, opens up a different perspective. Especially when knowing how tangible and significant that person is in actuality. Crossing the second ice sheet much higher up, and much more terrifying. I soon reached the narrow rocky ridge that runs to the right of the glacier. The path wasn’t marked but reasonably clear from the people that have passed before me. 2 ladies who went trail running to the lake on the other side of the glacier and were on their way back. They were also at the cabin the night before and knew of my plans. Having been over at the other side, they advised against completing the crossing all the way to Salka due to adverse weather. The low clouds were barely an appetiser of what it was hiding. I was ready to turn back and recalibrate my plans, but not before making it as far as it would be safe. Thanked them for their help, and hustled along. On one side of the steep ridge was the mighty glacier. On the other side were thick walls of accumulated snow. Here’s the snow on the right of the ridge. Was this close to permafrost? With summer almost over, lots of snow still remain, even at the relatively low altitudes of 1,000m. Little waterfalls there went behind the snow walls. Halfway up the glacier, I met my friend on his way down. He had brought a little gas burner and got some hot water ready. The wind was getting stronger and rain had started, the warm drink couldn’t have came at a better time. A snug spot to keep the wind from blowing out the flame, while we get some hot water. Is it even possible to get a better view for afternoon tea? Fresh ice just a grab away if you prefer your tea chilled. He told me the conditions ahead were really harsh, but there might be a chance if I could find a way over the rocks, avoiding the snow as much as possible. It was hard for small talk on that narrow space in strong winds, so we took some photos and were soon on our way. There was no one else on the trail ahead. My friend heading back down. Hope to see him again soon. Not long after, the trail over rocks ended, and continued over snow. Footprints clearly marked the way forward. Where the trail over solid ground ended. The mercury was rising, barely, but just enough to melt the snow a little. I was losing my footing every other step over the loose and melting snow, and I could barely see the way ahead. I looked around, hoping to find the trail over the rocks to avoid the snow. Nothing resembled a plausible path forward. I fell over one more time, this time harder, and sliding a considerable distance down. This time, I got scared. If i fell any further, I might be on my way down the glacier. An icy death would be certain, either from falling into one of the bottomless cervices on the glacier, or sliding all the way down to bottom and slamming hard on whatever was after the drop. With a heavy heart, I knew this was it. I couldn’t risk another hard fall on the steep icy slops. I made my way back, slowly sliding down the ice and using my hands to guide my way back to the trail on hard ground. In exchange for admitting defeat, Mother Nature returned my life. For some reason, I had surrendered, but not felt defeated. After getting back on the trail. I turned and looked back up, realising how crazy I had been to even imagine it possible for me to cross that. It was a familiar view all the way down, but I was glad to have been alive to see it. The wind blew faster and rain fell harder, but my steps felt lighter. Part of growing up for me in the past few years, was learning to pick the right battles, and knowing when to back away. I’m still learning to pick the right battles, but today was an important milestone in learning to back away. View over the glacier lake at Tarfala. Nature, elegant and stunning in one moment, terrifying and wrathful in the next. On the way back down. The clouds still obscuring whatever was at the top of the glacier. Going back was much easier, although the rising temperature had made crossing the ice sheets a slightly trickier affair. Not long after, totally drenched, I was back where I started that morning. Everyone else was gone by then, replaced by unfamiliar faces in the cabin. The few other hikers in the cabin might have gotten a shock though, with this dripping Asian dude with a full backpack appearing from the ‘wrong’ direction, emptying out his bag to get a map, looking confused and reaching over to ask them ‘May I know what day is it today?’ with a slight slur due to lips numb from the cold outside. I had to make a new plan quick to be able to keep the rest of my holiday (post-hiking) in order. And after 4 days in the mountains, I had lost track of the date. It didn’t take long for me to figure a new route out either. I wasn’t going to take any more risks and was going to stick to the safest main trail all the way to Abisko. I’d require a little quicker hiking, skipping a few cabins, but imaginably manageable. I felt relieved. And so was Lars, who just entered the cabin. He had warned about crossing the snow trail. I emptied my bag into the dryer room (at a friendly 30 degrees celcius) and headed back to the same room. My Finnish friend was long gone by now. I started a wood fire on my own for the first time in my life. Took a few tries, but in the end had a nice fire going. Fire never felt better. Had the room to myself that day, and brought the temperature up to probably something similar to back at home. The first wood fire I’ve started in my life (excluding barbecues back home). Not exactly environmentally friendly but I finished quite a bit of wood that day. Watching wood burn is a surprisingly good remedy for cold and emo days. Later in the afternoon the hikers left, and all was quiet, except for the howling wind that shook the entire cabin every now and then. Well equipped kitchen at Tarfalastugan. Just as it appeared that I would be the only one that night, I spotted 2 figures approaching from the distance. It was a little unnerving seeing people out there in the open at the mercy of the raging wind and rain. Soon they arrived, 2 elderly Swedish ladies who made their way from Kebnekaise. I was amazed at their resolve in reaching Tarfala, especially when one of them recently had a knee op. Hikers braving the elements to reach Tarfalastugan. After they settled down and got into warm clothes we chatted for awhile. Turns out that it was not their first trip to Tarfala, and they had made several visits over the years. They described witnessing in person, the glaciers shrinking dramatically over the years. It was a sad story, a first hand experience of the very tangible and visible impact of climate change on our planet. I hope the wood I had burned that day didn’t contribute too much to it. As dusk approached, more people arrived and the drying room was full. I shifted some of my stuff back to the room on a makeshift clothesline next to the fire to free up some space for others. A hot cup of milo while watching the rain and snow. Had an enjoyable chat that night, under soft candlelight, with the wind still howling and cabin still shaking. Maybe it was the conditions outside, or the mental fatigue, or the wisdom that resonated, but it felt ethereal that night. The weather the next day was the best of the 3 days I had been at Tarfala. Many of the peaks were finally revealed as the clouds steered clear. The plan for the day was not difficult, but would be a little long. 8km back to Kebnekaise and another 14km to Singi. 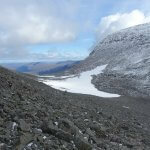 From Singi, it will be on the Kungsleden all the way and I wasn’t expecting any more hiccups. I set off early, bidding farewell to Lars for the second time. Tarfalastugan (Tarfala Mountain Cabin), one last time. A last video from Tarfala mountain cabin. I’ve never loved sunshine more. Looking out to the exit of the valley. The Tarfala Valley looking so different from the previous 2 days. Every few steps, I stopped. This time to not catch my breath, but to tun back and catch the irresistible shots. Snow capped peaks, glaciers and all. About 1km from the mountain cabin is the research station. There was a helicopter shuttling between the research station and some point further down the valley, bringing equipment over. And back to the first glacier at the exit of the valley,Storglaciären. I’d imagine that it would look much larger in winter, and even larger decades back. Most of the glacier is hidden behind the mountains though. And finally, the last video from the Tarfala Valley, with all 3 major glaciers visible. Unforgettable place, and I’m really, really happy to have made the trip here. Goodbye! Stay amazing (and icy)! Just before leaving Tarfala for lusher valleys at the lower altitudes. Out of the valley, the trail dropped steeply. On the trail between Tarfala and Kebnekaise. The same waterfall as 2 days back, on the other side of the river. Passing on the other side of the river on the way back to Kebnekaise (by not crossing the suspension bridges). This side was covered by rocks and harder to pass as compared to the path using the bridges, which was a nice smooth dirt track mostly. Climbing over rocks to get down the trail. Where the trees (or at least shrubs) grew again. Passing this signpost for the third time, hopefully the last time, as I returned to Laddjuvaggi, the valley connecting Kungsleden (at Singi) to civlisation via Nikkaluokta. And that completed my 2.5 day adventure to Tarfala. A little behind schedule, but in high spirits, as I continued towards Singi for the rest of the day.